This marked the countries' reconciliation on Bure Front along Ethio-Eritrea border where their soldiers faced off against each other just months earlier. Nairobi: The leaders of Ethiopia and Eritrea visited their shared border to celebrate Ethiopian new year together on Tuesday, marking the countries’ reconciliation on a frontier where their soldiers faced off against each other just months earlier. Ethiopia’s Prime Minister Abiy Ahmed and Eritrean President Isaias Afwerki visited their troops stationed at Bure, a region that saw some of the fiercest fighting during their 1998-2000 war. Tensions over the border burned on after the fighting ended, until Abiy offered to end the military standoff this year as part of a package of reforms that has reshaped the political landscape in the Horn of Africa and beyond. 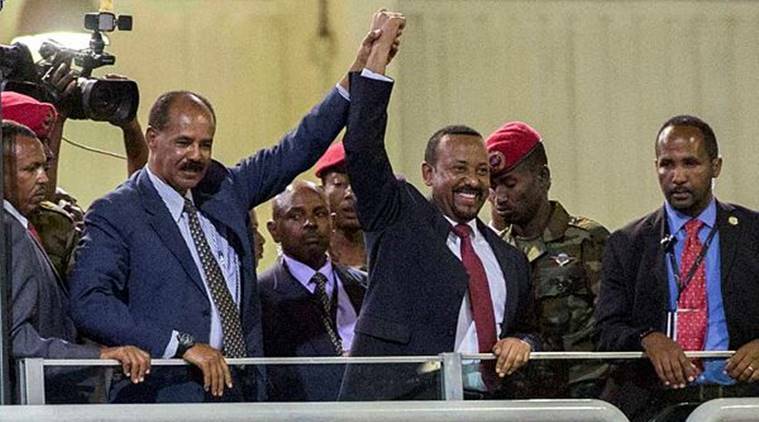 “PM Abiy Ahmed and President Isaias Afwerki are visiting Bure Front along Ethio-Eritrea border to celebrate the New Year with members of the Ethiopian & Eritrean Defense Forces following the full normalization of the relations between the two countries. #Ethiopia #Eritrea,” Fitsum Arega, Abiy’s Chief of Staff, said on Twitter. Pictures on Fitsum’s Twitter account showed Abiy and Isaias walking side by side. Since signing an agreement in Asmara on July 9 to restore ties, the Eritrean and Ethiopian leaders have moved swiftly to end the two decades of hostility. Eritrea reopened its embassy in Ethiopia in July, and Ethiopia reciprocated last week. The two countries have resumed flights. Eritrea has agreed to open up its ports to its landlocked neighbour and last week announced plans to upgrade a road between them. Residents on another part of the border said Eritrean and Ethiopian soldiers started clearing landmines on Monday. Ethiopia follows a calendar similar to the ancient Julian calendar — which started disappearing from the West in the 16th century — meaning the country will enter its year 2011 on September 11. Unlike the Gregorian calendar used officially in Eritrea and the West, Ethiopia’s version squeezes 13 months into every year — 12 months comprising 30 days each and a final month made up of just five or six days depending on whether it is a leap year. Time is also measured differently in the Horn of Africa country. Days start at dawn rather than midnight.